I’ve reorganized my Tupperware a zillion times and it always ends up looking like a mess after a week or two. Until now – after much experimenting I found a system that works! I’m about three weeks in to my new system and my drawer still looks this organized. My six year old daughter emptied the dishwasher today, and without extra instructions was able to instinctively tell where every piece went. • Empty the drawer or cabinet completely. Pile all contents on the floor, and while the space is empty dust it or wipe it off to give yourself a nice, clean slate. If you have random containers throughout your kitchen, round them all up together. • Sort: make piles of similar sets, lids, etc (kids make great helpers with this part), let go of ones you don’t want or need, and let go of broken or incomplete ones (i.e. items with missing lids). I kept two sets of glass, a set of plastic portion-control containers, and got rid of all other random and mismatched items. 1) File lids upright in small boxes. My son’s shoeboxes worked perfect for me. Don’t have a kids shoe box on hand? Sounds like a great excuse to buy some new shoes. It’s a great investment as this was a really key part of my system. 2) Stack pieces inside of each other, with no lids on since those are already neatly filed. Stack round inside round, square with square, and make separate stacks for glass and plastic. 3) Arrange your stacks and lids nicely in your cupboard or drawer, and don’t pack them too tight. A little breathing room is a good thing. If you really want to get crazy, create shadows or outlines of what goes where. For example, I could draw square outlines where my square stack goes, a rectangle for my rectangle stack, and circles for my round glass ones. 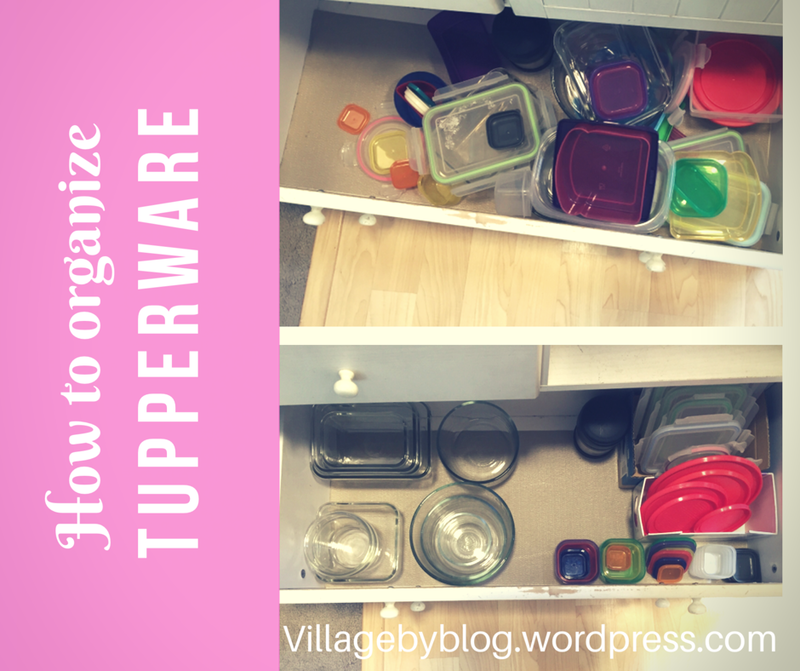 Tupperware has always been hard to keep organized, but like I tell my kids – we can do hard things! What’s the most challenging part of your house to keep organized?